Tablets and smartphones are a widespread norm, but what about styluses? When looking around you in a classroom or a meeting, you still don’t see people fervently writing away on their tablets using a stylus. They’re either typing, or using a plain old pen or good old paper. After comparing a good set of styluses Stylus Showdown: Back To School Review and Giveaway Stylus Showdown: Back To School Review and Giveaway It's Back-To-School month, and all through the month you've had chances to win great back-to-school items such as the ASUS VivoBook X202E touchscreen laptop, the Timbuk2 Power Q laptop backpack and a custom-made budget gaming... Read More , and another set of more affordable ones Griffin, TouchTec, AmazonBasics Styluses Review and Giveaway Griffin, TouchTec, AmazonBasics Styluses Review and Giveaway Today, I will be reviewing 3 kinds of styluses from three different companies. I will be checking how each stylus performs in different touch-screen tasks, how comfortable each stylus is to hold and use, and... Read More , I can tell you why that is. Writing with a stylus is just not that comfortable. The thick rubber tips are nothing like a pen, and many apps get completely confused when you rest your palm on the tablet’s screen. And, really, who can write anything with their palm in the air? To solve these problems, some newer apps offer palm rejection technology, and some styluses are doing their darnedest to become more like regular pens. Equipped with a very fine tip and Bluetooth technology, the $75 Adonit Jot Script tries to solve all these problems in one go. Can it deliver on its promise? Can Adonit make a stylus that’s actually worth paying $75 for? To find out, we bought one. And as usual, one of you will also win this premium stylus for free! Adonit is a well-known stylus maker, and the Jot Script is their newest addition to the line. Unlike most stylus makers, most of Adonit’s styluses have unique tips which you won’t find on other styluses. We loved the Adonit Jot Pro Stylus Showdown: Back To School Review and Giveaway Stylus Showdown: Back To School Review and Giveaway It's Back-To-School month, and all through the month you've had chances to win great back-to-school items such as the ASUS VivoBook X202E touchscreen laptop, the Timbuk2 Power Q laptop backpack and a custom-made budget gaming... Read More — a more affordable solution at $29.99 — for its unique plastic tip made for sketching, drawing and writing, but no matter how good it was, it didn’t really feel like a real pen. With the Jot Script, Adonit did several things differently. To start, we have the fine, 1.9 mm tip, which, at least according to Adonit, is the thinnest on the market. With a tip like that, it feels much more like a pen than a stylus. The tip is not made of rubber like most stylus tips, which means it acts more like a pen when pushed against an iPad’s screen. The Jot Script is battery powered (one AAA battery), and is equipped with Bluetooth technology for pairing with certain apps. According to Adonit, this not only allows for palm rejection, but for greater precision and accuracy when used with those apps. While the Jot Script should work with any capacitive screen, it’s really made for iOS devices, and Adonit promises nothing when it comes to any other device. Is the Jot Script really the only fine-point stylus on the market? It sort of is, at the moment, but it definitely won’t be for long. JustMobile, makers of our past stylus showdown winner, the AluPen, have just announced the AluPen Digital this past CES. The AluPen digital should be available in Q1 of 2014, and is expected to cost only $50. The recently funded TruGlide Apex features a 2.4 mm tip and uses active circuitry to offer better precision when writing on a tablet. The Hex3 Nota is another successful attempt at a fine-point stylus, but with its 3.7 mm tip, it’s not as fine as the Jot Script. It’s available for pre-order for $50, and comes with an extra tip. Similar to previous Adonit styluses, the pen-like feeling of the Jot Script starts with the packaging. Rather than going for something trendy and unique, Adonit opts for an old-fashioned plastic box which greatly resembles a premium pen packaging. 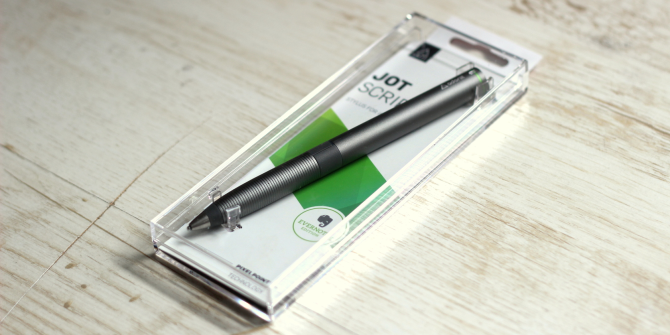 The Jot Script comes equipped with one AAA battery, which already resides inside the pen when you open it. In order to prevent the battery from draining, Adonit has included a small plastic tab inside the stylus, which you need to remove before you can turn the stylus on. This is done by unscrewing the end of the stylus. Adonit has done everything to make the Jot Script look and feel like a regular pen. Looking at the Jot Script with its very fine tip, you can almost think it’s actually a regular pen. Why almost? The Jot Script is a bit too thick and a bit too heavy to feel like a regular pen. After all, what regular pen hides a AAA battery inside? While it does weigh only 15 grams (0.5 oz) without the battery, it goes up to 29 grams (1 oz) with the battery inside. Aside from that, holding the Jot Pro feels like holding a regular pen. The striated top part makes sure the stylus doesn’t slip in your hand, and the power button is so inconspicuous, I managed to miss it completely at first. Good thing the Jot Script comes with a basic manual. The true highlight of the Jot Script is its super-fine tip. Indeed, this too looks almost like a regular ball-point pen. The tip feels like it’s made of some kind of metal, and if it weren’t for the heavy weight and power button, I’d almost expect it to sprout ink. As mentioned above, the Jot Script is made for iOS devices, and although it may have “limited functionality” on other touchscreen devices, don’t hold your breath. 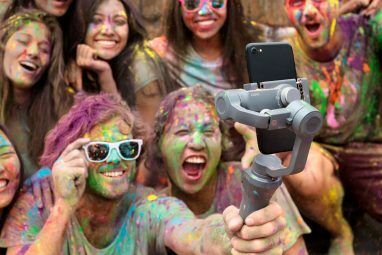 Its more advanced features, such as palm rejection and extra precision, require Bluetooth 4.0, and will only work on iPad 3 and newer, iPhone 4s and newer, and both iPad Minis. Looks are fine and dandy, but at the end of the day, it’s not looks that really matter. The Jot Script looks like a regular pen, but what does it feel like to use? To find out, I first put it to the test as a regular stylus, using it for mundane things such as browsing and typing. The first thing you need to know about the Jot Script is that it doesn’t work at all when turned off. This is true for any kind of action you want to perform with it, from scrolling to tapping. Unlike regular rubber-tip styluses which mimic a regular finger on a capacitive screen, the Jot Script’s tip needs power in order to have an effect. To turn the stylus on, give the power button a long press and wait for the green light to appear. Once powered on, the Jot Script is an average stylus for most jobs. It’s easy enough to use for most everyday functions, but it didn’t always catch every tap, requiring me to repeat it two or three times before it was recognized. It works well with drawing and sketching apps such as SketchBook Express, and, while it’s not exactly made for drawing, the fine tip feels really good for a non-artist like me. But the Jot Script is made especially for handwriting. So I decided to try the Jot Script with the app it was truly made for: Evernote Penultimate. The Jot Script is not called “Evernote Edition” for nothing. The stylus was developed in partnership with Evernote, and no matter where you look — be it on Adonit’s website, Evernote’s website or the Jot Script’s booklet — everything points at Penultimate as the app for this stylus. Penultimate is a free handwriting app for iPad that syncs with Evernote, and is made for all sorts of note-taking and sketching. You can use the Jot Script with Penultimate as is, but in order to make the best of it, you need to pair the two. You can now use the Jot Script to write in Penultimate, without worrying about palm rejection. You can even choose the palm position that most accurately fits that one you actually use, whether left or right-handed. But does it truly feel like writing with pen on paper? Unfortunately, not so much. On the positive side, the Jot Script usually keeps up with normal-speed handwriting, and unlike other styluses, it doesn’t often miss strokes when you’re going too fast (this does happen from time to time, though). It does, however, lag quite significantly behind your actual pace. As you go along writing, the letters themselves start to appear with a greater and greater latency, until there’s a noticeable lag between your strokes and the actual letters appearing. From time to time, the app seems to lose the Jot Script entirely, at which point, it just stops responding. Instead, you’ll find that your palm is the one that is suddenly registering — not very good for a stylus boasting such advanced features. While the experience is not perfect at first, it definitely improves as you get used to both stylus and app. As you go along using them, you’ll learn the right amount of pressure you should use with the stylus (it doesn’t need much), and you’ll discover whether you’re more comfortable writing in zoom-in or zoom-out mode. If you’re not planning to do a huge amount of writing, and want to use the Jot Script and Penultimate for light note-taking, along with some easy sketches, the experience is excellent all around. The Jot Script truly does feel like a regular pen on the iPad’s screen, and it’s very responsive for small sketches and some short hand-written notes. It’s worth noting that the Jot Script’s hard tip does make quite a bit of noise when used on an iPad screen. This is not silent writing like pen on paper or rubber tip on screen — there are some pretty noticeable taps. Hopefully, these won’t bother those sitting next to you in class or in a meeting. The Jot Script acts differently with each app you try it with. For example, I tried it with INKredible, a new note-taking app that had palm rejection built into its interface. Palm rejection worked flawlessly with this one (without even pairing the two! INKredible doesn’t support Adonit’s SDK), but the stylus required a lot more pressure than with Penultimate. SketchBook Express, on the other hand, did not require this extra pressure, but doesn’t offer palm rejection. While Penultimate is the app the Jot Script was made for, it’s not the only app to support it. There are three other apps that can currently pair with the Jot Script, and surprisingly, some of them offer even more advanced features than Penultimate. At least on paper. The compatible apps are Noteshelf, ZoomNotes and Goodnotes — all paid apps that have limited free versions. On paper, Noteshelf and ZoomNotes also support button shortcuts with the Jot Script, but I couldn’t get them to work on the first, or even find how to enable them on the second. On Noteshelf, although it does mention and recognize the Jot Script, the shortcut settings are all for the Jot Touch, which is a different stylus. This could be a matter of updating the app to support the newer stylus better. The Jot Script does pair with all three of these apps, and works well with them. I was especially impressed with Noteshelf, which made handwriting with the Jot Script even easier than Penultimate. Should You Buy The Jot Script? The Jot Script is an impressive stylus, and and enjoyable one to use. However, it still doesn’t provide that flawless stylus experience we’re all waiting for. No matter how rare, the glitches that do exist prevent it from feeling like a regular pen, unless you’re used to using faulty pens that keep running out of ink. If you often use your iPad in class, meetings, or anywhere else where you need to take short notes, you’ll probably enjoy the Jot Script. But don’t expect it to truly replace pen and paper, as neither stylus nor apps are quite ready for this. Bluetooth enabled fine-point tip styluses are pretty new, and they’re bound to get better with time. Instead of shelling out $75 now, it’s probably smarter to wait for the technology to improve some more before investing that much in a stylus. If you’re an early adopter, or if taking short notes and some sketches on your iPad easily could really improve your productivity, there’s no reason to avoid the Jot Script. It’s a good stylus with a good user experience. It’s just not for the masses, yet. Congratulations, Kendall Brice! You would have received an email from jackson@makeuseof.com. Please respond before February 21 to claim your prize. Enquires beyond this date will not be entertained. Funny, while I agree with most of the review I wonder what button on the Jot Script you expect apps to support? There's only one button, the power button. LOL. No, I don't currently, but REALLY want to use this one. Am a big fan of a paperless life, and the glitches in the review video are not a show stopper for me, and this device seems bounds ahead of others I have seen. I use a stylus on the iPad when I'm in the mood to write or draw without my finger. I currently use a Bamboo Stylus. I do use a stylus, but am always looking for one with a better tip! I do not use a stylus. But. I could use a stylist and a wardrobe. I don't use a stylus at the moment but would certainly like to do so. I used to have a stylus but itbroke easily - used it for casual painting, drawing,etc. I don't own any stylus at the moment. Nope, I don't have one. Don't have a stylus (yet) for my tablet. Would like to get one. could really use this as a student! I sometimes use a stylus, but not all that often. jUST GOT A nEW iPAD, I could use this! I don't use my stylus b/c of frustrations w/fat tips. I don't use a stylus. I don’t use one now, but I would like to with the right one. I do not currently use a stylus - I am more comfortable with a keyboard (so far). I don't use one right now, but I would like to. I use a stylus for note taking at meetings. I would love to try this one. I don’t use a stylus. I do not use a stylus at the moment. Yes, I do use a stylus. I use it mainly for sketching. I think I'll pass. Review not very compelling. Yes. Mainly for drawing on Sketchbook Pro. I own a knob stylus - a cheap one that comes as free gift with my tablet - and I use it either to sketch and play games . I'd prefer my finger as the screen is more sensitive to it than the stylus Never knew they are making fine-point styluses for capacitive touchscreen. All this time I thought only Samsung thought of it with their S-Pen. Good thinking! I do have a stylus, but it's a cheap rubber tip. General navigation is what I use it for, as it appears to fail to detect as a writing utencil. I use a stylus for highlighting and note-taking. I don't currently use a stylus, but in fact l'm looking into getting one. Yes, I use it on my Wacom Intuos3. No I don't use one. No I don't, but looking to start using one. I don't currently use a stylus but want one for annotating documents (marking student work). I've used a number of styli but haven't been happy with any of them, so I'm interested in trying this one out. I use a rubber tipped cheapy stylus....it works ok but can be very frustrating at times. I don't currently use a stylus. I use a rubber tip stylus all the time with my Nexus 7. It's ok for most things but not for writing. I'd like to try this fine tip stylus and be better able to use my drawing apps. No, I do not currently use a stylus. If I did, it would prominently be for my tablet. Currently use a Jot Adonit Jot Classic and really prefer it over the 'rubber' tipped models. It gives a more precise and finer line than the bulky wide rubber tip. i don’t have a stylus. But this is way cooler than using finger. I have one, rubber tipped. Use it for browsing, not for writing. I am looking for one good stylus to write notes on android devices. I use the stylus supplied with my Surface Pro 2 for generating notes in OneNote and for quick emails. Very useful. I don't use the stylus. I have a stylus but rarely use it. i don't have a stylus. I don't currently use one, but have been thinking about it. I use Evernote to take meeting notes regularly, but written notes still seem more comfortable to me than typing. I am considering a stylus but might wait for the technology as recommended. I currently use the Adonit Jot Flip for note taking at work and in meetings on a daily basis. Having the chance to use the Adonit Script could be bliss! I currently use a stylus for taking notes on my iPad. I have used the Adonit Jot Pro for over a year now in conjunction with Penultimate. I have just recently started using the Adonit Jot Script and it works great. I disliked the wide stylus that are readily available at retail stores. In testing the Jot Pro I liked that it felt like a pen and was responsive. With the zoom capabilities now available in Penultimate the Adonit stylus is great. The clicking noise is not noticeable when writing in cursive but if one prints then the clicking noise is more noticeable but no more so than someone using a keyboard sitting next to you in a class. I like the fact that I am now paperless and can take notes on my iPad and sync them to all my computers. Adonit still has some work to do to make the pen and wrist protection even better. With my fingers, almost everything. I don't have a stylus but would use one for taking notes when attorneys come into my office. No, I don't use a stylus. I use one occasionally. The ones I have tried are too unpredictable so I'm still looking for one I like....maybe this one. No, I don't currently use a stylus. I use it for drawing. I have a Samsung stylus for use with my Galaxy SIII, but it doesn't work on my iPad Air (nor did it work on the iPad 2 before) or on the Windows Surface RT tablet. I use a stylus on my tablet (Galaxy Note 10.1 2014 Edition) works quite well but I don’t have one for my iPad, this looks like a great choice. i use on my Galaxy Note 2, but not much on my tablets I find them unprecise. I don't currently have one. I don't own a stylus. Don't use a stylus because I type faster. Might be useful for writing code but who knows. No I don't currently use a stylus because I don't own a single one. i dont have one,but would like to start!! No, none of my electronics need it. Don't currently have a stylus at the moment but always wanted to try one. stylus for the wifes tablet, its just easier than a finger sometimes. I don't have a stylus...yet! I don't have one but would love to own it! I use a stylus for drawing. I use my stylus to take notes. I use it for drawing and sketching. Yes, I use it (occasionally) for writing and drawing. I have a cheap one that I have used from time to time playing games on my iPad. I use a KlickStylus sometimes to write quick notes. And I sometimes even use it on my iPhone 5S. No, I dont use any stylus at the moment. Nope, I don’t have a stylus! No, I don't have a stylus. Currently, I do not use a stylus. When I got a new phone I was really hoping for a Samsung Galaxy Note 3 that would come with it's own stylus, but it was out of my budget. I've considered getting a stylus for doodling, sketches and quick notes, but haven't yet. You are right $75 seems a bit steep for something that doesn't work 100% flawless. I've used a stylus in the past, but my Tab was so weak that It was very poor performing. This would be great for my new tablet. I have a small inexpensive one, This one would be great for school. I have tried a variety of styluses... but I'm always disappointed. I am very intrigued with the Adonit Jot Script... and would love to try it. No, I don't have one. I use one for the app Paper on iPad. Hope this one is better! An ASUS - Eee- ASUS Eee Pad Transformer Prime TF201. Yes, I currently use a stylus from a pen. It's small and compact and I got it free from work. It is used on my oversized phone. This seems to be a pretty awesome product. Don't use a stylus for my phone for the simple fact that none of them are comfortable enough to use. This one looks like it will do the trick. Nope, no stylus use as of yet, but ones like the Jot Script are interesting, as I'm looking to go to digital note taking. I use a stylus with my Galaxy Note II that I quite enjoy and would like to try something with my tablet. Nope, I don't have a stylus! I had been using a stylus, but the low-cost versions do not have a fine point so the accuracy in "writing" is terrible. So I've completely stopped using the stylus as my fingertip works just as well. I would start using a stylus again if I had one that was as fine-tipped as this one. I sometimes use a cheap stylus for my iPhone to play games. when my fingers get tired. I write in "real life" daily with a pencil and would love to start using a stylus to write online! Yes, but they are cheap and break quickly, so no. I like it over my finger though. No, but I need one. I use one now for taking notes in class and for homework. This stylus looks like it would be a great fit for my needs. Occasionally I'll use one for drawing. Don't currently use a stylus but if i won I'd use it for the networking events I run.